Blue flowers bring a feeling of calmness and peace to a garden in the spring, a needed element after the harshness of winter. Plant spring blooming blue flowers where they will make that first impression--under the front windows or as a border round the lawn. Blend them with red and white flowers for an all American display. Even tiny blue flowers get a garden off to a good start for the rest of the season. Periwinkle (Vinca minor) is also known as myrtle, creeping myrtle and vinca. The plant is an evergreen ground cover that grows up to 6 inches tall and 3 feet wide and does well in partial or full shade and a soil that moist and well-drained. Dark-green leaves grow singly along the stems and in clusters at the tips. Single flowers with five petals and a white center with a darker star design in the middle bloom in profusion in March and April, and then sporadically throughout the growing season. Periwinkle is a native of Europe and Western Asia and is hardy in USDA Zones 3 to 8. Blue bugloss (Anchusa azurea 'Dropmore) is hardy in USDA Zones 3 to 10. The plant grows from 4 to 5 feet tall and 1-1/2 to 2 feet wide. Deep-blue flowers measure 3/4 inches across, resemble a forget-me-not, grow in clusters at the top of the stems and bloom from May to June. Plant blue bugloss in full sun and soil that is medium-wet and well-drained. Speedwell (Veronica peduncularis 'Georgia Blue') has clusters of tiny, round, blue flowers that bloom in April and May. Leaves start out as red-green in the spring, turn green in summer and bronze in fall. The plant grows up to 8 inches tall and 12 inches wide. Speedwell is hardy in USDA Zones 6 to 9. The plant likes full sun and a soil that is moist and well-drained. Columbine (Aquilegia vulgaris) grows up to 1-1/2 feet tall and wide. Flowers bloom in April and May. Leaves resemble a fern with a marbled pattern of green and yellow. Plant columbine in full sun or partial shade and a rich, moist, well-drained soil. The flower is hardy in USDA Zones 3 to 8 and is a favorite food source for butterflies. Ladybells (Adenophora liliifolia) grows up to 2 feet tall and 2-1/2 feet wide and is hardy in USDA Zones 3 to 9. Medium-green, egg or lance-shaped leaves measure 3 inches long and grow on the stems. 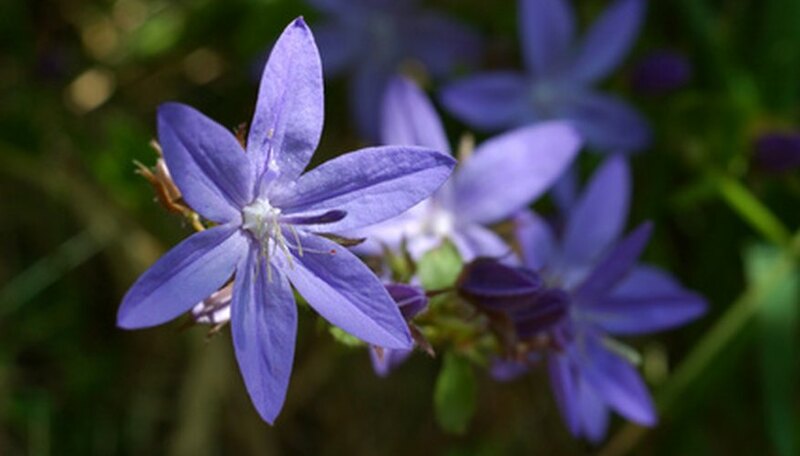 Bell-shaped flowers measure 3/4 inches long and grow in clusters at the tips of the stems. Flowers bloom in May. Plant ladybells in full sun or partial shade and a soil that is moist, organic and well-drained.